We ate a lot of quiche in Paris. They have the freshest eggs that you can buy at the fromagerie from a basket. Loose, brown eggs, top grade, just take a handful. The pastry is always superb, flaky and buttery. We had small quiches with jambon (French ham) mostly, but one day I bought a salmon quiche. I am in a quichey kind of mood. I have some recipes from other bloggers bookmarked in my favorites, and Lisa at Jersey Girl Cooks made this yummy sounding corn quiche this summer, that I have been wanting to try. I love making quiches and tarts, especially special ones w/ crab meat or ones with scallops and artichokes for luncheons, served with a nice salad on the side (I sound fancy, don't I?, when was the last actual luncheon I hosted???? 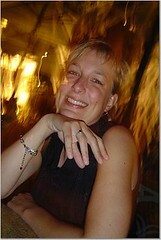 I think it was my friend's bridal shower in 2003!). I usually make my own tart/quiche crust from Martha Stewart's simple pate brisee recipe. But tonight, I wanted something simple and scrambled eggs just wouldn't do it! I had a frozen pie shell in the freezer so I made Lisa's corn quiche and changed it up a bit. I had a lonely zucchini in my vegetable bin begging to be used, so decided to throw that in with some fresh basil. It came out very yummy for the tummy. The husband liked it too, because as Lisa will tell you, REAL MEN EAT ANYTHING! (that "Real Men Don't Eat Quiche" thing from the 80's is a bunch of crap). In a heavy skillet, saute your defrosted corn, onions, scallions, and sliced zucchini for about 10 minutes until vegetables are soft and wilted. Add salt & pepper to the vegetable mixture. Set aside. In a large bowl, whisk eggs, half & half and add fresh basil and shredded cheese. Mix your vegetables in with the egg & cheese mixture. Pour everything into your pie shell and bake for 40 minutes on 350 degrees. Serve with a nice tomato salad on the side. Not very French, more like New Jersey, but hey, tastes like home! The zucchini is a nice addition. I might try it with that next time. That quiche looks absolutely delicious! I use those frozen pie crusts too. If I have one in the freezer, I am definitely making this! Thanks for the recipe. This looks really yummy! I love the combination of corn and zucchini together. I have made a zucchini pie that my family loves. 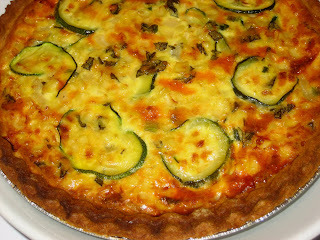 It has more zucchini that eggs - so not as quiche-like. I like the addition of the corn in your recipe. 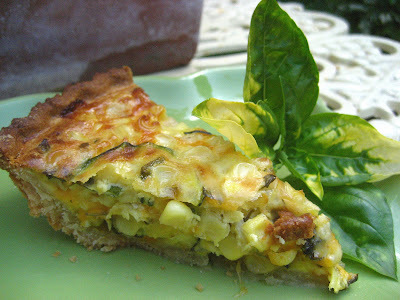 Corn and zucchini in a quiche sounds fantastic! I always feel like the crust would add so much time that I usually just make frittatas. But, I should really make a quiche one of these days! I just bought 5 ears of corn at the farmers market, and now I know what to do with them. This recipe looks delicious! Thanks for the idea!! Stacey, Mmmmm, love all the flavors here, and you quiche looks so golden brown. I agree about the "real men eat anything" statement. My husband would be first in line to dig into this, I'd be second! I made this recipe this week and it was delicious! It will be in our normal rotation for sure! I used almond milk and reduced fat italian blend cheese. I ended up baking it longer and actually broiling it at the end for color. I think next time I'll try 40 min at 375 instead. Thanks!